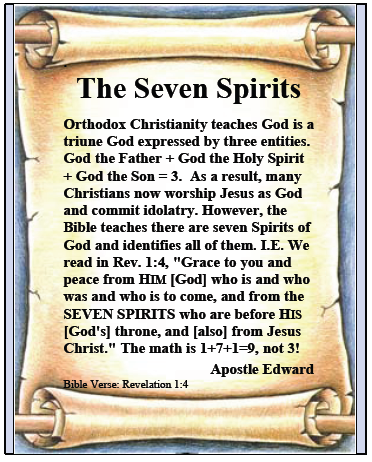 Apostle Edward | The Seven Spirits | Apostle John Says "SEVEN SPIRITS Are Before God's Throne!" Observe that God is on the throne and He is described or characterized as [He] "who is and who was and who is to come." In Rev. 1:8, the identity of the Alpha and Omega is also characterized as [He] "who is and who was and who is to come." Some Bibles imply that Jesus is the Alpha and Omega, but this is only a reference to God Almighty. The New American Standard Bible [NASB] clarifies the verse as follows. In Revelation, we see the above attributes of God identified. Note that SEVEN SPIRITS are before God's throne and that they belong to Him. We also see some attributes that are identified as belonging to Jesus. Note these are distinctions between God and Jesus! Jesus gives Apostle John the messages for the seven churches. Remember that Jesus has taught us that he only speaks and does what God tells him to say and do. Therefore, these are God's messages and warnings for the seven churches delivered through Jesus and the human hand of John. So we see something different emerging from the Word of God. There are actually SEVEN SPIRITS and not just one. The Orthodox Christian doctrine called the trinity, which created a triune God, ignores six of the seven or 85.7% of God's Spirits. You might surmise that if you ignored 85.7% of any given subject, that you are for the most part completely ignoring the subject. For example, would a final grade of 14.3% on any type of exam satisfy you? Is it any different with the seven Spirits of God? of God. Jesus plus the Father [God] plus His seven Spirits is nine, not three as when only the Holy Spirit is considered and counted. God sent all seven of His Spirits into all the earth. How many can you name? For most Christians, the answer would be one. The Holy Spirit or Spirit of Truth taught as part of the triune God doctrine of the Church. The Church through its doctrine of the trinity has created a God that is not the God that Jesus knew. The trinity doctrine raises some important questions. A) Exactly which God did Jesus say we were to worship and serve in Mt 4:10? B) Exactly which God did Jesus say he was returning to in John 20:17? C) Exactly which God did Jesus say was the only true God in John 17:3? D) Exactly which God did Jesus say we were to listen to in John 8:47? Yes, the trinity doctrine transgresses God's commandment to have no other gods before Him. This commandment includes His only begotten human Son Jesus Christ. There are now Christians who worship Jesus, a human man according to the Bible, as their God. "God is not a man that He should lie, nor a son of man, that He should repent. Has He said, and will He not do it? Or has He spoken, and will He not make it good?" Orthodox theologies and doctrines explain away or argue around simple verses like this one by claiming Jesus was simultaneously both 100% man and 100% God. Ergo, Jesus was even able to worship himself? All such teachings are nonsense and God's Word stands firmly as it is written. It does not need to be interpreted through a trinity doctrine that was created by the Church. Some may want to explain away these seven Spirits. However, I must caution them. Those who speak against God's seven Spirits may be blaspheming God's Holy Spirit. When Moses proclaimed to God's people that the Lord God was One, he was trying to educate them. The Egyptians had multiple gods. No doubt, Moses wanted to make it very clear, there was just one true God. This isn't all that complicated. The word "one" means exactly "one". There is no place in the Bible where you will find any "three" or "trinity" proclamation. So, exactly who was the God that Moses talked to? Wasn't it the same God Jesus prayed to and worshipped? And, isn't it clear that God did not manifest Himself to Moses via three different entities? The trinity doctrine makes Moses appear as a liar. Did Moses lie to us? So, if there are actually seven Spirits of God and the Bible teaches that the Lord God is One, how do we explain the trinity doctrine? We see from historical documents attributed to Ignatius, the third bishop of Antioch, that he taught the trinity doctrine in the latter part of the first century and maybe as early as 80 or 90 A.D. In The Epistle of Ignatius to the Ephesians, [chapter 4, v13] we read: "God himself appearing in the form of a man." As the early Church was forming, it created the trinity doctrine and then began to teach it as orthodoxy and absolute biblical truth. I attribute this deception to Satan with the full intent to lead man astray and away from God. Much of the Bible, as we know it, was not available in the early years. Today, with modern Bible software, there is no excuse for perpetuating a satanic and evil doctrine. The trinity doctrine is evil because it leads people away from the one true God and has many now worshipping another god in place of Him. What an incredible insult to our God who sacrificed His only human Son Jesus. "And every spirit that does not confess that Jesus Christ has come in the flesh is not of God. And this is the spirit of the Antichrist, which you have heard was coming, and is now already in the world." If you believe that Jesus was not all human [flesh], you have the spirit of the Antichrist. I didn't teach it; the Apostle John taught it. However, I will teach you this: The trinity doctrine is the deceptive work of Satan designed particularly for these End Times. Now that you know that there are seven Spirits of God sent into all the earth and that Jesus had them all at his disposal, exactly who are these Spirits? You will find God’s seven Spirits in the Bible as follows. The Contemporary English Version, New Living Translation and other bibles refer to the Spirit of Truth as the Holy Spirit. This is not the same Spirit as the Spirit of Holiness. There is a lot more to God’s Spirits that could be studied. Note that the Scripture references point directly to Jesus Christ. These are the seven Spirits that God gave Christ. They are also the seven Spirits that God sent into all the earth. How many Spirits of God have been given to you? It is my prayer that more than one has, because I do not believe you are saved unless you at least have the Spirit of the Fear of the Lord and the Spirit of Truth. Certain Scriptures indicate this; some of them have been discussed in the other street tracts and more information is online in the Book of Edward at http://www.bookofedward.org. Isn’t it curious that the Spirit of truth is sent back to those who begin a new life in Christ Jesus? It is because God’s manifested power in our new life begins with His truth. When you can believe Him instead of the Church! Can we honestly say we know God if we do not know His seven Spirits? And, if we do know His seven Spirits, can we still believe in a man made Church doctrine called the trinity? A doctrine that denies the God found in the Bible and substitutes a man made and Church created, triune pagan god? Pagan god? Harsh sounding, yes, I know. But isn't that exactly what any man made triune god is? The Orthodox triune god is not the God of Moses and not the God of Jesus! And, it is not the God of Abraham! God lamented to Moses the following. "Oh, that they [My people] had such a heart in them that they would fear Me and always keep all My commandments, that it [everything] might be well with them and with their children forever!" There is nothing that God has asked us to do that is not for our own good. When we learn to fear God, we also learn to obey Him. And we find out that God only wants the best for our lives and the lives of our children. Still, God's people have a history of leaving God behind and ignoring Him. And yet, God has continually sought fellowship with man. At the heart of Jesus' teachings is the firm instruction to return to God Almighty. This means that our God is a personal God that wants to be involved in our lives and not an impersonal God that could care less about us. Listen carefully to a very personal dialog as Jesus talks with his [and our] God. Jesus isn't talking to himself or to 1/3rd of a triune god. Jesus is talking to God Himself, the Father, which is "the only true God!" You cannot claim to have received the gift of salvation unless you know the God that Jesus knew. His purpose was to help you return to God: to give you an understanding of Him so that you would have eternal life. Jesus did not come to us with God's Word to supplant his God. You don't know Jesus if you do not know the God Jesus served. The lamentation of God that things would go well for us if we only feared Him and obeyed His commands is clear. Yet, God also lamented, "if only we would return to Him." When all else is said, it was God's clear purpose that His Son would help us "return to Him" by making His reality and the reality of an eternal life after this earthly existence clearer to us. Even today, God wants a personal relationship with you and asks that you return to Him. Will you? Will you accept the God that Jesus reintroduced us to? The God who has seven Spirits? The New Jerusalem Bible [NJB] expresses the above verse as follows. The verses are numbered slightly different in the NJB. God has Seven Spirits before His throne! Study the Scriptures cited in this booklet very carefully. While in the Spirit, God gave these Scriptures to me for your benefit. Please open up your heart to God's Word and let Jesus Christ, our Teacher, become the example you follow all the way back to your own heavenly home. Do this and you will not only love Jesus and the sacrifice he made for our sins, you will also fall in love with God. You can call Him heavenly Father in all of your prayers. Heavenly Father and God of my brother Jesus Christ, who is our Teacher, hear my prayer. Bless every soul that reads this booklet and will open up their heart to Your Son Jesus and also to Your Spirit. And, to all who pray the salvation prayer on the next page, grant them repentance. Father God, I accept this special invitation of Yours to an eternal life in heaven. I confess with my mouth that You raised Jesus Christ from the dead and that he is the first of many humans to be resurrected to be with You, as Your sons and daughters. I believe in my heart unto righteousness and I will do my best to live a righteous life in Your eyes. I will follow the example of Jesus and be faithful unto my own death. Father, I thank you that You and Your Son will become one with me to help me overcome this earthly life. I know that this will make us of one mind and that Your Spirit will dwell within me to guide my path back home. Teach me Your ways Lord. Please accept God's Invitation to an eternal life. This may be the only time you will be presented with God's Word. These are only the basics, but they will get you started on a life with God and His Son Jesus Christ. You must understand that Jesus Christ is God's human begotten Son; he is not God. It is as simple as believing what Jesus taught us and accepting Scripture over manmade church doctrine. If your church doesn't preach the Word, find another church that does. You can read more about this topic and others at http://www.bookofedward.org. Notations in small caps such as Lord, He, Him, His, You, and Father refer to God. Scripture Key: If you keep the relationship between God and His begotten human Son straight, you will understand your Bible and God's invitation to an eternal life will be for real. It's a key to understanding His Word. Contact Information: Apostle Edward may be contacted using an online feedback form or by mail. Prayers & donations welcomed.